Cesar Alex Carrillo pulled up at the McDonald's in Colchester early on March 15. Carrillo, 23, and his wife, Lymarie Deida, 21, were on their way to the Chittenden County courthouse. Carrillo faced a DUI case, but they weren't worried. The couple already knew from a previous hearing that Carrillo's misdemeanor DUI charge would be dismissed. They ate a leisurely meal as snow fell outside. Carrillo paid for a homeless man's breakfast, Deida said. Afterward, Deida lay her head on her husband's chest as they sat in the car. The previous Sunday, they had found out that Deida was pregnant. "He said, 'This year's going to be a good year,'" she recounted in an interview Wednesday with Seven Days. Just hours later, at 9 a.m., Carrillo was pulled over by Immigration and Customs Enforcement agents and arrested. Carrillo was the first of three Migrant Justice advocates who were detained last week in Burlington on immigration-related charges. Carrillo's cousin, Enrique Balcazar, and Balcazar's girlfriend, Zully Palacios, were also detained. All three were being held in the Strafford County detention facility in Dover, N.H., which also serves as a county jail. It's been a bewildering and exhausting week for Deida, who is a U.S. citizen. She agreed to talk to Seven Days at the Burlington offices of the advocacy group Migrant Justice. She arrived with her and Carrillo's 4-year-old daughter, Solmarie, and her mother, Marisol Rivera. She wore her long black hair parted down the middle and spoke with a calm self-assurance that belied her 21 years. Deida gave the following account of her early life and how she came to marry her husband: She was born in Williston, and attended local schools. She was raised speaking both Spanish and English by her Puerto Rican parents. She met Carrillo in 2010 in a Spanish-language church her family runs in Williston. Deida was 15 at the time. When they went to Denny's for their first date, Carrillo fumbled with his utensils to cut his steak. They hadn't planned on a long-term relationship. Then Deida got pregnant. She was 17 when she sat Carrillo down and handed him the results of a pregnancy test. He slumped "as if his soul went out of him," she said. But they stuck together. Deida gave birth to Solmarie at age 18. Her mother and husband took turns caring for the girl while Deida finished high school in Williston, Deida said. The couple lived with her family, and later in an apartment with Balcazar and Palacios, she added. The two married on January 22, 2016. Carrillo worked on dairy farms, in maintenance and in construction, his wife said. Deida worked at the front desk of a local hotel. They could pay the bills and still manage to send money to his family in Tabasco, Mexico, according to Deida. She said her husband had come to the U.S with his mother when he was 16, and that he was used to providing for his family. His father had committed suicide when he was 12, leaving him to care for his brother and two younger sisters, Deida said. "Some kids are trying to buy a bicycle. He's providing for his family," Deida said. "He's very respected in Mexico." Deida described Carrillo as charismatic, the figure who lights up any room he enters. Deida's mother, Marisol Rivera, 54, butted in: "Funny, too," she said in Spanish. She sighed. "The injustice of it hurts me," she said. Two months ago, the couple bought a trailer in North Hero, Deida said. "It was a fixer-upper," Deida said, but she was pleased; it was their own space and Carrillo was a handyman with the skills to make it homey. They never had a full conversation about deportation, she said. "Of course I was worried about it, on and off," Deida said. In the 15 years her family had run the church, she hadn't known anyone who had been deported. Besides, she added, "I'm the type of person, I don't like to talk about things like that. I'd tell him, 'Don't worry, it won't happen to us.'" She said they had started paperwork that could have begun the path to Carrillo's legalization, but never submitted it. That's her biggest regret, Deida said. She said her husband had never had run-ins with ICE. Last week, as the two looked for a parking space in front of the Edward J. Costello Courthouse, a tan unmarked SUV pulled in front of Carrillo's car, blocking their path, she said. Carrillo objected, and clung to Deida when an immigration agent approached. Carrillo was under arrest for immigration-related charges, the agent said. Deida said she urged Carrillo to get out of the car. The agent told Deida, who has only her driver's learning permit, to follow them to the ICE office in St. Albans. Later, she said, she was allowed 15 minutes with her husband. The hope had drained out of his eyes, she said, and he told her, "Just come with me to Mexico." Deida said she told him that's not an option, and that as soon as she left, she called Migrant Justice. Carrillo was held on $21,000 bail. He was transferred temporarily to the Northwest State Correctional Facility in Swanton before being transported by van to Dover on Sunday. After the arrest, Deida said, her facade of calm collapsed. She became violently ill on Saturday, vomiting uncontrollably. She was hospitalized. Her blood pressure went up, and at 4:30 a.m. Sunday morning, she miscarried, she told Seven Days. Distraught, she said, she recovered at her mother's house. In her less realistic moments, she imagines that she'll walk into a room where Carrillo will be slouched on the couch, playing on the Xbox, forgetting to check the beans cooking on the stove, she said. She said she tries not to read the negative comments posted on news articles about the situation. She jumps whenever her phone rings. She said she is helping Solmarie cope as well. During the interview, the 4-year-old buried her face in her mother's shoulder. Some people have come out in support, Deida said: Migrant Justice workers and volunteers have been "amazing." Middlebury College students made a host of cardboard signs for protesters to hold at a rally. When Deida went shopping at Walmart, a woman recognized her from TV news coverage, and gave her a hug. "During the day, I'm a mask," she said. "During the night, I'm all torn up." She said Carrillo and Balcazar were being held in a 25-bed unit in the Dover facility. When Deida sent him money, she said, he shared the ramen noodles and deodorant he bought with Balcazar. Earlier this week, he sent her a message on a tablet provided for inmates to share: "Thank you for being my rock." Deida recounted how on Monday, she had spoken before more than 200 attendees at a rally for the detainees in front of the Statehouse. "I was terrified," she said. She read them a message from her husband: "Thank you for your support. Keep on with the fight." Both Carrillo and Deida have been in contact with Matt Cameron, the Boston-based immigration lawyer representing the three detainees. Cameron is working to build a case that the trio should be released on minimum bond, $1,500. Then come the removal proceedings, which could take years. The worst-case scenario, Deida said, is that if Carrillo were deported to Mexico, she thinks he could return legally within a year — because he's married to a U.S. citizen and has a child. "I believe our family shouldn't be separated by a wall or a border or a fence," she said. 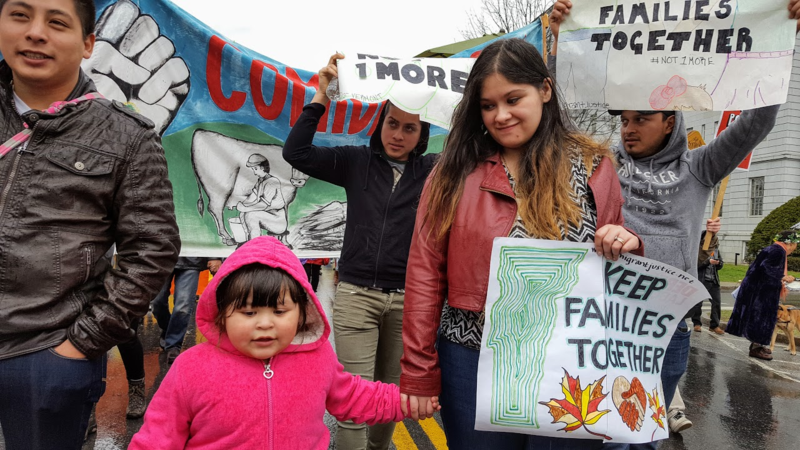 Whatever happens, Deida plans to attend, with her family and other Migrant Justice advocates, the bail hearing in Boston, which they expect to be held next Monday. "We'll make our presence known," she said. Deida grinned. "We're going to have a really big banner."